The most common reason sales managers do not integrate sales training on a consistent basis with their teams is..they think they do not have the time. Let’s think about exercise. Do you say you can’t exercise because you don’t have time? Do you know people who say that? Yet every day, there are plenty of ‘busy’ people in the fitness center, on bicycles, at parks walking or in front of a video at home exercising. There are plenty of sales managers thinking they are too busy to train – while there are plenty who do. What’s the difference – besides the ones that do have better performing sales teams? Put it on the calendar with your reps a few weeks in advance. You are less likely to let your reps down and cancel it. Because if you do cancel, you are sending your reps the message they don’t count and you aren’t dependable. If you think they won’t care because your reps don’t like going to sales training, then you are the problem and you are not giving them the right kind of sales training for them to be better. 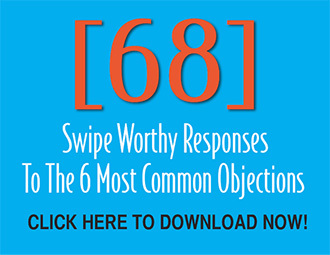 You want sales training to make a difference to the very next sales conversation. What’s going on with your team? What’s happening in the market? If you were to select one skill to improve or add to their repertoire, which would be gladly received, what is it? No one wants their time wasted, yet everyone (at least most high achievers) gets energized by the challenge to up-level their skills. 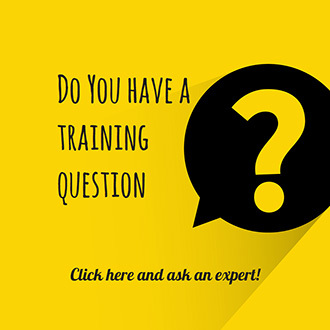 Don’t get in your head that all sales training needs to be weeks, days or hours long. Short bursts of bite-sized training is better for both young and older adults. Our attention spans are similar to those of eight week old puppy dogs. 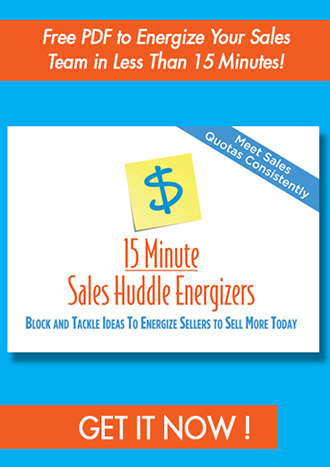 So finding five, ten, fifteen or thirty-minute max sales training engages, energizes and equips your reps to sell more today – not tomorrow – but today! Sounds good. But, how do I pull it off without spending hours scouring the web for those clever ideas and quality exercises and activities for relevant skill boosting – because remember I’m a busy sales manager! I’ve made it easy for you and all you need to do is Tip 1: Schedule The Time. Because I’ve taken care of Tips 2 and 3 for you. 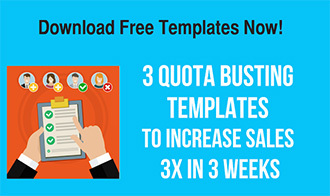 My team and I have designed three years worth of done-for-you sales training meetings – all 32 minutes or less! Every thing you need to build your reps skills to blast the heck out of the competition in 30 days max! Some are huddles, others short motivating movie clips and then there’s the intensive skill booster. We have a joke around the office– but it’s really the truth and not a joke – and we say… if you can read, talk and tell time – all at the same time – you’ll deliver a high impact, high payoff stellar sales meeting to drive sales and get your reps at the top of their game. 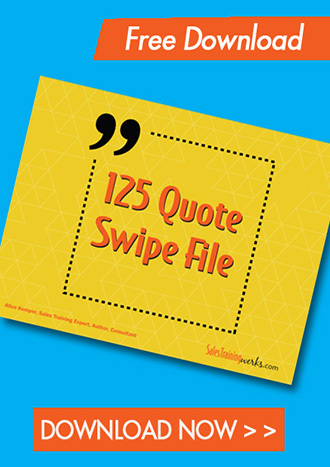 Here’s a link to get a four free sales training outlines. 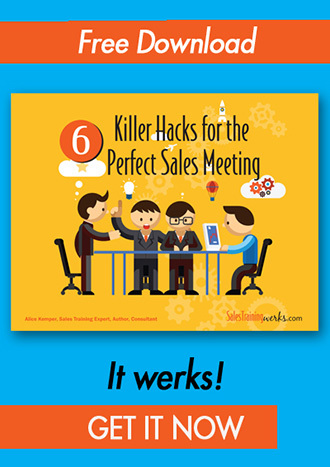 There are two 15 minute sales huddles, one 20 minute motivating movie clip, and one 30 minute skill booster. The beauty is… you know you need to train your reps and you say you don’t have the time, but you don’t want your competition to be stealing your deals. So try these out and next thing you know… you team will out-think, out-perform and out-sell the competition.